A few years ago, I bought my boy a really cool mining kit for his birthday. It had a bunch of gemstones embedded in a plaster rock that he had to patiently dig out. 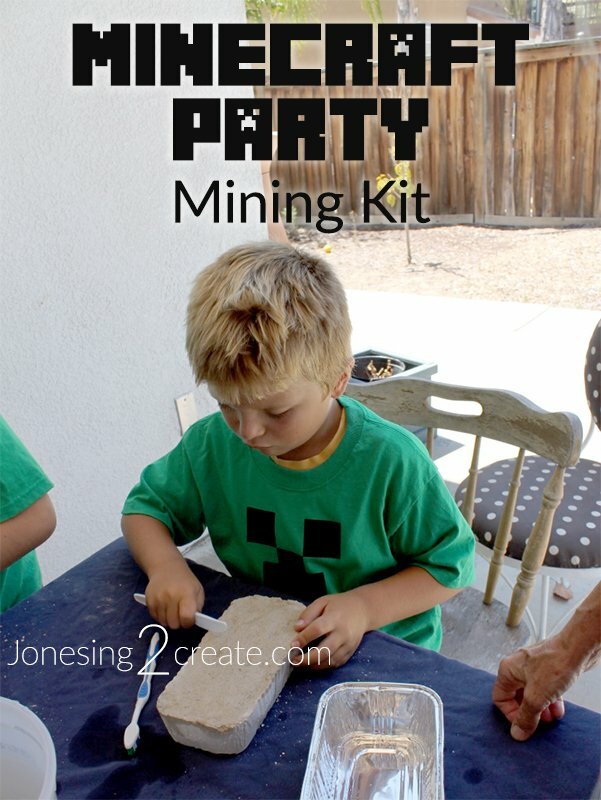 It was a hit and I thought it would be fun to do something similar for his Minecraft party. I couldn’t afford to buy a block for each boy, so instead I was able to make them at home for about $3 each. This was really a lot of fun and I loved watching the boys dig away for their gemstones. I was able to make 15 of these in about two hours. 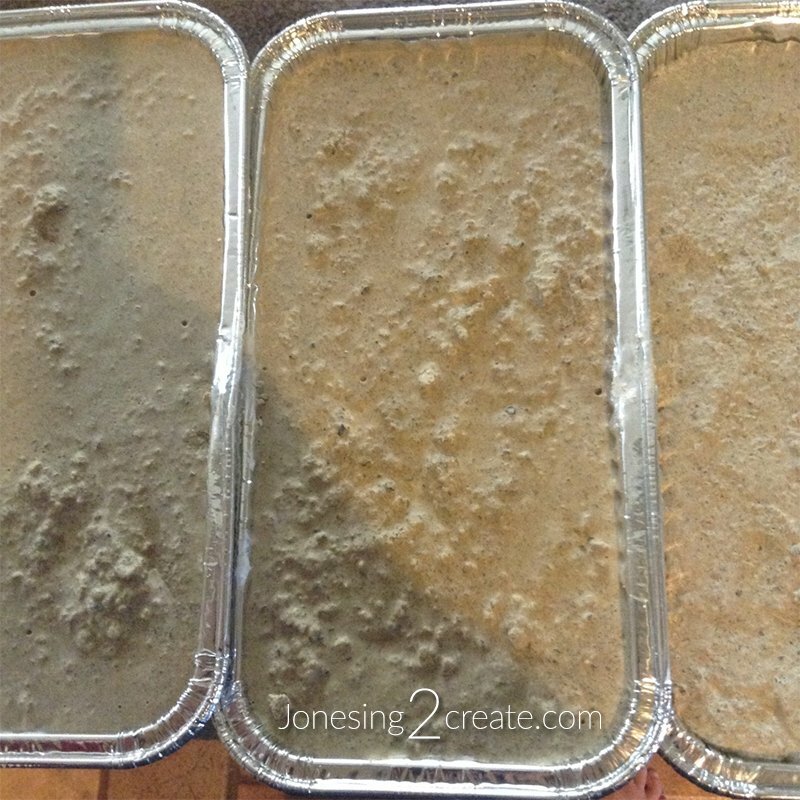 The mixture tries quickly, so you have to have everything ready and work fast. I tried to mix enough for three blocks at a time, but found that it dried way too fast. It was much easier to just do one block at a time. 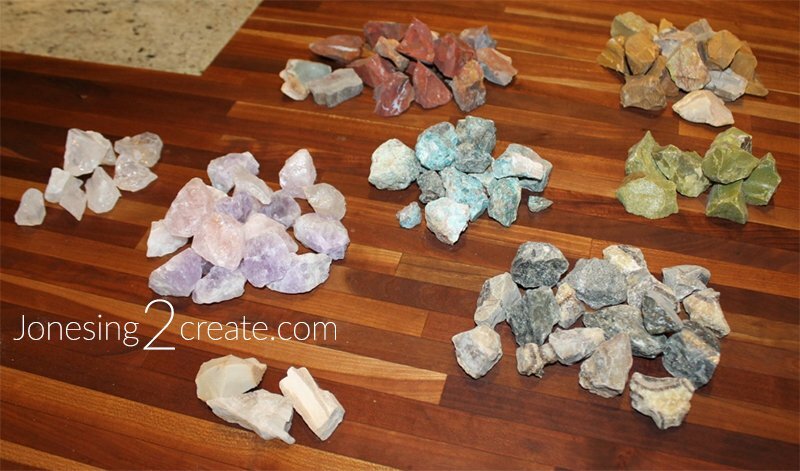 Gemstones: I bought these in bulk off of Amazon. I bought two 3lb. bags of a mix of Amethyst, Labradorite, Septarian, Rose Quartz, Green Opal, Girasol Opal, Desert Jasper, Blue Apatite, Red Jasper, Petrified Wood, Yellow Jasper, and Chrysocolla. Each bag was about $15 and I received enough stones that I was able to place about seven stones in each mining block. So for each block, it was only about $2 for the stones. Getting the stones wet really brings out their beauty. 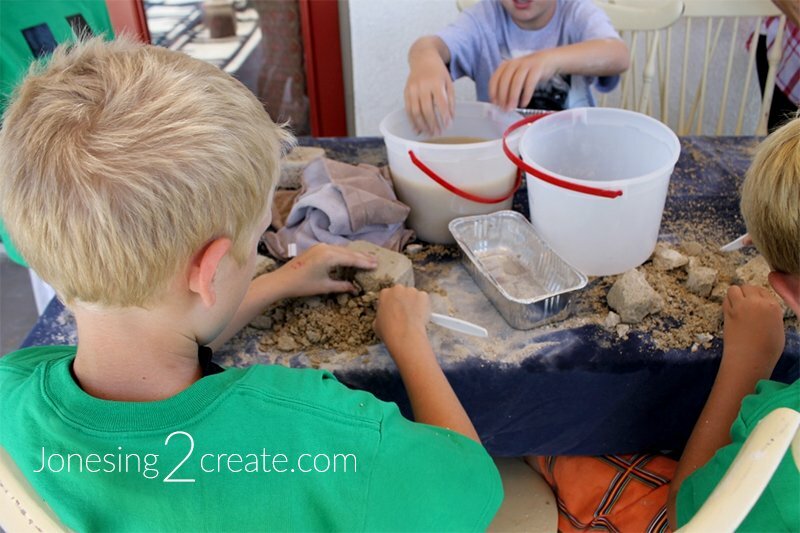 Plaster of Paris: I used a cup of plaster of Paris per block. You can get a 4 lb. bag of it for about $7 at Lowes or Home Depot. 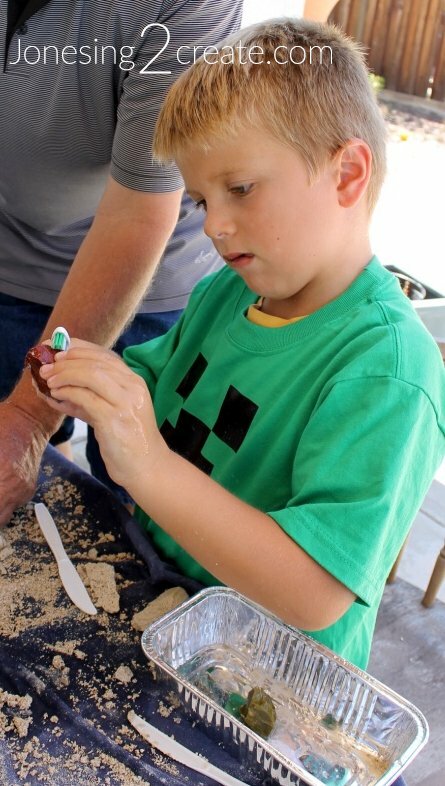 Sand: The texture of your sand will greatly impact the texture of your block. A finer sand will be more like the blocks they sell at the stores and won’t crumble as easily. I used a coarser sand and while the blocks turned out great, I will probably use a finer sand next time. You can buy a 50 lb. bag of sand at Lowes or Home Depot for about $3 to $5. Mold: For the mold, I bought small loaf tins at the 99 Cent Store. I was able to get 3 for a $1 and they were the perfect size. Bucket: You will want some kind of bucket to stir everything together in. I used one of those big ice cream buckets so that I could just throw it away when I was done. Stir Stick: The mixture can be murder on your hands, so you want something to stir with. I started out with one of those wood stir sticks you use with paint, but it broke. So instead I used a large plastic spoon. Measuring Cup: Grab a measuring cup that you don’t care about so that you can measure out the right quantities. 1. Make sure that everything is prepped and ready to go because you will have to work fast. Beforehand, I went through all the stones and divided them up so that it would be fair. I had each stack of stones by the loaf pan so that they would be all ready to put in. 2. 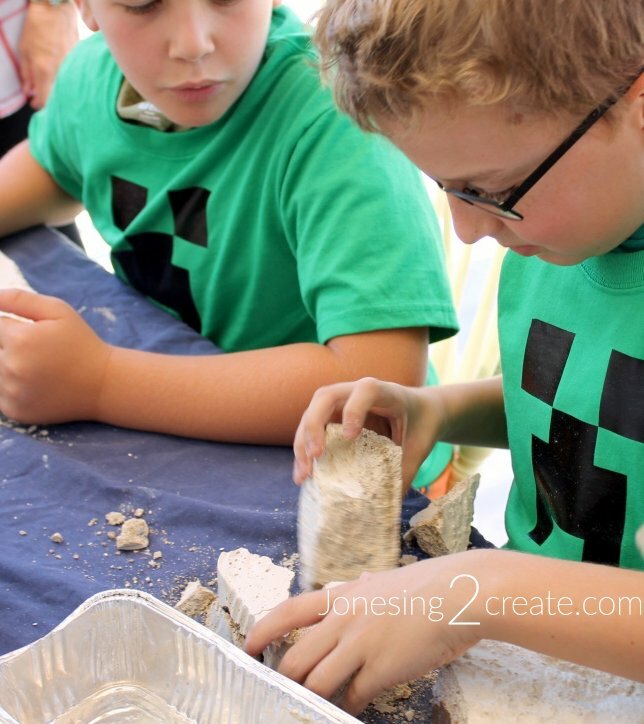 For each block, mix together one cup of water, one cup of plaster of Paris, and three cups of sand. If you want to make the blocks harder to chisel, reduce the amount of sand. If you want to make them easier, increase it. I found that three cups was a little on the easy side, but that two cups was really very hard. But a lot will also depend on the type of sand you are using too. I was using coarse sand, so that also made the block easier to chisel. 3. Fill the loaf pan halfway full and then push some of your stones into the mixture. 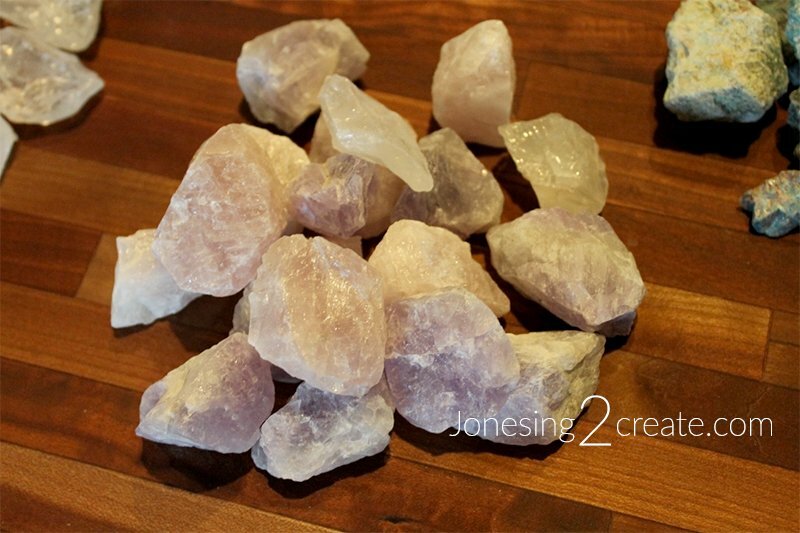 I then added a bit more mixture and layered the rest of the stones into the pan. Once your stones are placed, fill the pan the rest of the way with the remaining mixture. Before it starts to harden, you can help things settle by taping or jiggling the pan a little. 4. Because of the plaster of Paris, things will start to harden quickly, but you will want to wait at least overnight to make sure everything has set. My kids were so excited to start digging, that I made them a little test one that they started digging away at after only about an hour. It kept its form, but was still too mushy and it made a mess. Luckily I had them do it outside! But at the party, when the blocks had set properly, it worked perfectly. The rocks I bought on Amazon came with an identification sheet, so we had fun figuring out which stones were which. The rocks were beautiful and the boys had a lot of fun finding them! To help with the digging, I gave each boy a plastic knife and then I had buckets of water, toothbrushes, and towels so that they could clean off their gemstones. This is such a great idea! 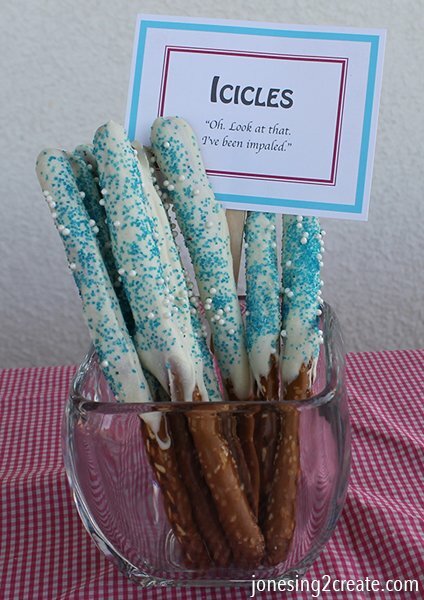 I’m going to do it for my son’s party. Thanks for sharing, I’m looking forward to more tutorials for all of these awesome party ideas! Thank you so much for your kind comment. It makes me happy to learn that others are enjoying these ideas too. We have so much fun with it! Love this idea. Attempting it now. Is it possible your measurements are off? My mixture is extremely watery. 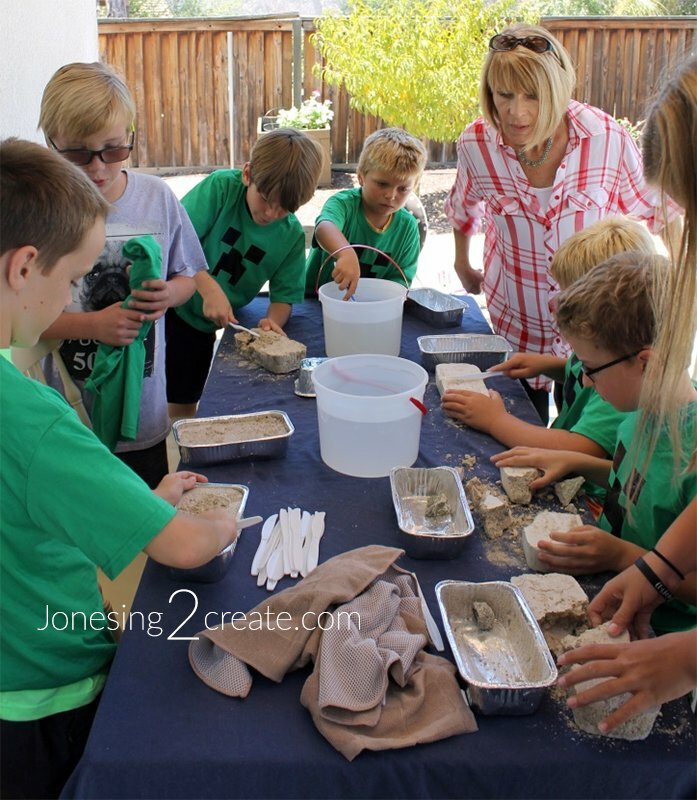 Are you using one cup of water, one cup of plaster of Paris, and three cups of sand? It should be easy to pour and stir, but not really watery. What kind of sand did you buy? Play sand? 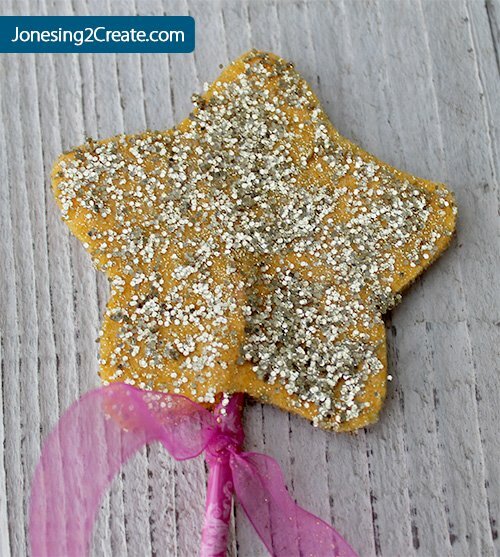 My daughter is having a rock party this weekend and I plan to make these, thanks for the great idea! Thanks! I just used the cheap bagged sand they have at Lowes. 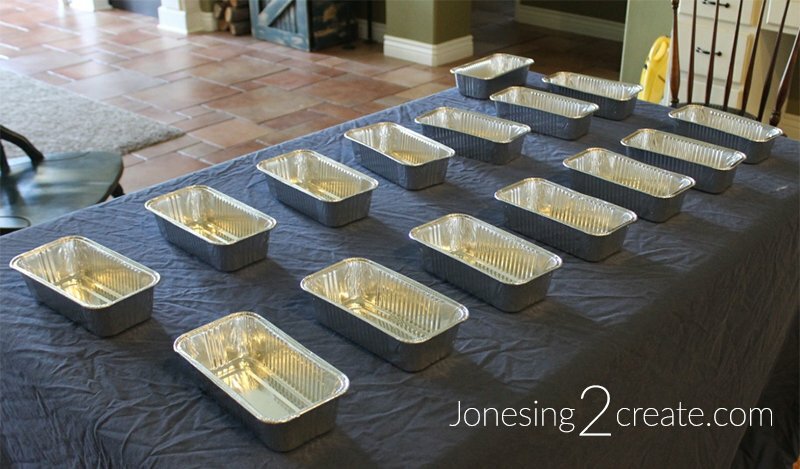 Did you use all 50Lbs of sand for the 15 trays made? I was about to try this idea, but saw ask the warnings about inhaling dust and skin irritation, and I’m wondering if parents might not be too happy with me giving it to the kids at my son’s party. Were there any such issues for you? We have done this a few times and haven’t had any issues at all. My son also has asthma, and he didn’t have any issues. The sand was very coarse so there wasn’t really any fine dust. It wasn’t much different than playing in the sand at the park. We have used the store-bought version of this before and the dust from the kit was a lot finer than from the homemade ones. I tried this and my son loved it! Did you also make their green shirts or have them made? I kept mine in the molds, so I can’t say for sure. I think they would be fine, but they could be messy because the sand can come off pretty easily. If you knocked it against something, there is also a chance pieces could break off. You might want to wrap them in something and make sure they were stored in a way to protect them. Thank you so much! We have a swim party planned for tomorrow, and I didn’t think of any rainy day activities. Well 90% chance of rain. I’m heading to the store right now! I need to make 24 of these. Did you have left overs of all the things you used to make them? Trying to figure out how much I need of each ingredient. I did have plenty leftover of the Plaster of Paris and sand. A quick Google search shows that 3 cups of sand equals about 2.4 pounds. So if you are making 24 blocks, you will need about 57.6 pounds of sand. And a pound of Plaster of Paris is around 2.5 cups, so you would need about 10 pounds. Hope that helps! Hi! About how long did it take the boys to “mine” the sand? I used a lot of sand, so it only took about 30-45 minutes. I have made blocks that have taken several days though. The ones that didn’t finish, just took theirs home to work on it.